With the rapid increase in the number of motor vehicles, the traffic pressure on highways are increasing, so are the accidents. In order to avoid such situations, we can use modern ITS technology to comprehensively and systematically manage the safety of highway network. HYTECH INC. develops a new ITS system product for traffic condition awareness and intelligent traffic control based on the patented technology of “Intelligent Dynamic Traffic Flow and Speed Shunt-induced Safety Management System in Highway Section”. Products are widely applied on motor vehicle lanes, reverse lane-crossings connects, access to city roads, entrances to tunnels, etc. Based on WSDR millimeter wave radar technology, this new system product can accurately aware traffic conditions in all weather and full illumination, and collect real-time latitude, longitude, latitude, size, running speed, direction, trajectory and other traffic data. With its reliable modular software, the product can dynamicly monitoring and early warning abnormal events such as slow running, parking, reversing, retrograde, U-line etc., and accurately distinguish pedestrians, animals, and debris. The false rate is ≤1 every 24 hours. Those traffic data combined with meteorological information monitored by meteorological elements meters, including temperature, humidity, wind direction, visibility, road surface conditions (wet/dry/frost/ice), timely and accurate comprehensive traffic information for road network monitoring centers can be gain. It makes up for the shortcomings of traditional monitoring means and provides a reliable basis for autonomous and intelligent traffic operation management. The system automatically evaluates the data after monitoring and analysis, and then controls lane indicators, variable speed limit signs and variable massage signs through some preset algorithms to gradually maximize the realization for intelligent control of traffic safety. All VMS have the function of graphic and text display, and can set variable speed signs of 120km/h, 100km/h, 80km/h, 60km/h or numbers showing any speed, or can display a variety of graphical signs that can indicate traffic conditions. According to the European standard EN12966, the optical performance requirements include speed limit signs, recommended speed signs, wet road signs, road construction signs, animal signs, as well as green, yellow and red lane indicator icons. “Green ↓” means that the road is unblocked, “yellow ↙↘” means that the road is crowded and changes to the adjacent lane, and “red Х” means that the road is closed. The control center of each highway section controls each road. 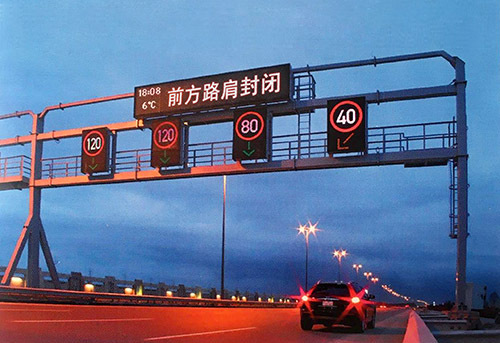 The gantry is set according to the traffic density, speed, weather conditions, road conditions and other historical conditions of the highway senction. It can be set motor vehicle lanes, reverse lane-crossings connects, access to city roads, entrances to tunnels, entrance and exit ramps and etc.